make sure you have a generator at home. What will you do if you have a disaster that causes the power to fail in your home? Don’t be left in the dark in the event of an electrical utility power outage or a natural disaster that leaves you without any power in your home or business. With a backup generator from ElectricMasters, you’ll have that protection from a loss of power, and it will keep you running at full capacity for all of your electrical devices. Most power outages and blackouts are resolved fairly quickly, but some can last for days, especially if they are caused by a storm or another natural disaster. However, when you have a backup generator, you won’t have to be without power for long at all. Home generators can get the power back up and running in your home in a matter of seconds. Whether a power outage occurs in the dead of winter or the middle of summer, chances are, it won’t leave your home feeling comfortable. Not only is it unfortunate for your home to be too hot or cold, but if the temperature gets too high or low, it can actually put you in a dangerous situation.  One of the top reasons to invest in a backup generator is that it will keep your home comfortable and your family safe, no matter what time of the year the power goes out. Most of the food in your refrigerator and freezer will not fare well for long in a power outage, and that’s especially true if you lose power in the middle of the summer. Depending on how much food you have stored, allowing all of it to spoil could mean wasting hundreds or possibly even thousands of dollars. Backup generators ensure that you can store your food safely, even when the power goes out unexpectedly. Did you know that there are 2 million burglaries reported in the United States each year? 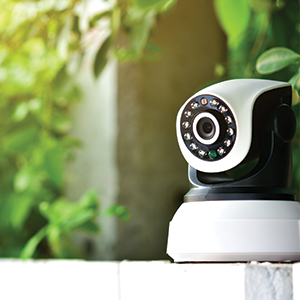 A security system can go a long way toward protecting your home and your possessions, but it needs power in order to work. 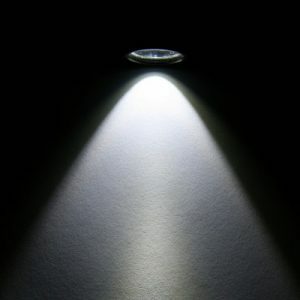 If you’re on vacation and a power outage occurs, having a backup generator installed will ensure that your security system keeps running no matter what, continuously protecting your home. In some cases, power outages are due to issues at the utility company, but many are caused by bad storms and other natural disasters. When you’re in the middle of a storm, and you’re already worried, it only makes matters worse when the power goes out and you can no longer stay connected to the world around you. A backup generator will give your home the power that it needs to give you peace of mind and keep you connected. Power outages in and of themselves are troubling, but they can inadvertently cause a lot more damage than you might realize. For instance, if you rely on a sump pump to prevent your basement from being flooded when it rains, you should know that your sump pump won’t keep working in the event of a outage, and you’ll have to deal with lots of expensive water damage as a result. Furthermore, in the winter, you have to keep the heat on in order to prevent your pipes from freezing, and you can’t do that when the power goes out. Keeping the power on is more than just about comfort; it’s also about safety! Not only do power outages cause trouble when the power is off, but they continue to cause trouble when it comes back on. When the power comes back on after an outage, it can cause a voltage fluctuation or a power surge, and if the surge is severe enough, it can damage appliances and other electronics that are plugged in and haven’t been turned off. Generators help to reduce surges after power outages, protecting your home and electronic devices. There are so many reasons to invest in a standby generator for your home because the fact of the matter is that you never know when a power outage could occur and you need to be prepared. 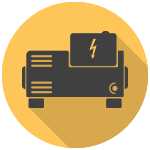 Why choose our ElectricMasters for your emergency generator? We are a Generac® authorized dealer, and our licensed electricians have been installing home generators for over 20 years in Cincinnati, Ohio and the northern Kentucky area. We know that weather can be very tumultuous during the summer and winter months, and you don’t want to be without that air conditioning or heat when you need it most. Our experienced electrical contractors will professionally install your new backup generator directly into your home’s existing electrical system, so there is no need for any additional, unnecessary electrical work. This is how we can keep your overall cost down when protecting your investment. Don’t be caught in the dark. Get the power you need with ElectricMasters. Power outages almost never occur at convenient times, but a loss of power doesn’t have to ruin your day or halt productivity in your office. Contact ElectricMasters today for your consultation for a newly installed generator for your home or office. Let our certified electricians keep your electricity on, no matter what!